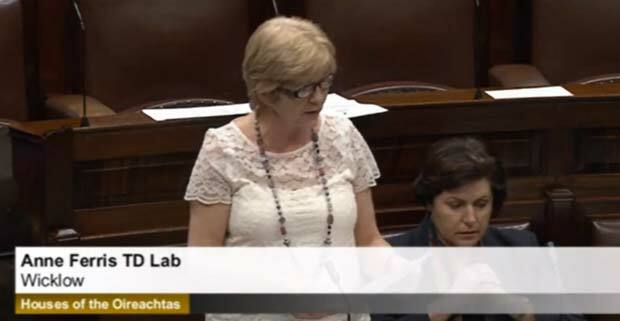 Labour TD for Wicklow and East Carlow Deputy Anne Ferris welcomed what she called “the first quality of life budget in a decade and a half”. “Ireland has come through a long three years of financial readjustment, preceded by more than ten years of uncontrolled and often wasteful expenditure. At long last we have a budget that is about the quality of people’s lives. This is the first quality of life budget Ireland has seen in more than fifteen years. “This budget is about homes and schools and jobs; it is about the environment and public safety. This is a budget which will help to build the kind of Ireland that we want our young children to grow up in and our emigrated children to return to. Yes, it is a budget about economic growth, but it is also a budget about fairness. “This budget will deliver sustainable housing growth starting with a direct investment of €2.2 billion in social housing together with measures to increase availability of land to private developers. “This is not like the bubble budgets of the Fianna Fail years. This budget will deliver jobs, but they will be lasting jobs. The jobs planned within this budget are largely independent of the construction investment programme. This budget aims to create the kind of jobs that still exist when the scaffolding comes down. “This budget is about education. It will provide new classrooms and more than 1,700 jobs for new teachers and special needs assistants. This budget reinvests in universities and institutes of technology, in literacy programmes, in our artists, filmmakers and young musicians and in our technologists of the future. This budget incentivises the growth of sustainable electric vehicles and moves away from environmentally intrusive energy sources, embracing research and development in innovative new energy sources such as ocean wave technology. It invests in food production, in sustainable Irish beef and seafood production. As a result of this budget there will be more Gardai on the street, new patrol cars and a fairer more transparent policing service. This budget is about restoring and improving the quality of life of today’s citizens and for the next generation.